Join Coconut Grove's "Cirque du Grove": The place to visit this Fourth of July Weekend! Fourth of July has gone to a whole new level this year at the Grove! 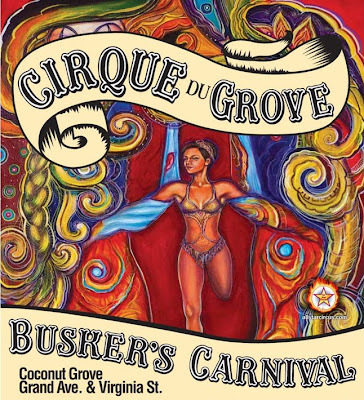 On Friday, July 2nd, the festivities for "Cirque du Grove: A Busker's Carnival" will kick-off with a spectacular fire show and a variety of street performances by Supernova. To join the celebration, arrive at Grand Avenue in Coconut Grove by 9 p.m. and enjoy the fire performances till 12 midnight. On Saturday, July 3rd, the party continues from 11 a.m. till 7 p.m. with an all-day line-up of special performers: Will Soto (Famed Wire Walker from Key West's Mallory Square), Cory Tabino (Former Cirque du Soleil Hand Balancer), Stilt Walkers, Balloon Artists, Magicians, Face Painters and Jugglers. For the art lovers: enjoy the Coconut Grove Gallery Walk and Art Stroll from 7 p.m. to 10 p.m. on Saturday, July 3rd. During this event, Grove galleries open their doors to visitors to debut their latest exhibitions. Guests will enjoy complimentary drinks and food while admiring the art displayed along the Mayfair Promenade. Finally, this is why you cannot miss the Grove for Fourth of July on Sunday! There will be an old-fashioned Fourth of July celebration called "Picnic at the Barnacle" from 11 a.m to 3 p.m. (The Barnacle Historic Park, 3485 Main Highway). You can also enter the "Hot Dog Eating Competition" at Cocowalk starting at 2:30 p.m. The grand finale occurs at Peacock Park (2820 McFarlane Road) with a free concert and fireworks show (fireworks start at 9:30). Start coordinating your red, white and blue outfits and get ready for an awesome weekend!! !